Weekend yoga at Vail Mountain is back this summer. 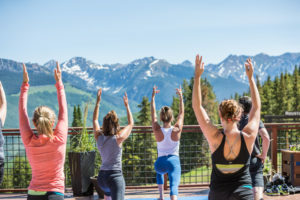 Both The Lodge at Vail, A RockResort, and The Arrabelle at Vail Square, A RockResort, will offer outdoor yoga to guests beginning this Friday, June 30. Be it at 8,000 feet or 10,000, yoga in the great outdoors is an opportunity to relax and reset. Vail Mountain Top Yoga Series, presented by Supergoop! Enjoy yoga above 10,000 feet Fridays and Saturdays, from 10 to 11 a.m. beginning Friday, June 30 through Saturday, September 2. The class will be held on the deck at The 10th restaurant, at the top of Gondola One. The cost per person is $10 for the yoga class, or, $40 for a lift ticket and yoga class. Participants can receive a complimentary Supergoop! branded water bottle and discount cards to be used on services at the RockResorts Spa at The Lodge at Vail. Chair massages will be available for $1 a minute at Mid-Vail following the yoga session, courtesy of the RockResorts Spa at The Lodge at Vail. Lunch is available for purchase at Mid-Vail and The 10th following each yoga session. The Arrabelle is partnering with Lolë to bring yoga to Lionshead Square every Sunday, from 9 to 10 a.m. beginning Sunday, July 2 through Sunday, August 27. All yoga sessions are complimentary and open to the public. Learn more about a unique lodging experience with The Vail Collection. *All yoga sessions are subject to change or cancellation, weather permitting.